Forty-five minutes is all I have left of today, and I have nothing to say. No commuting nightmares this morning, so homicidal thoughts today (well at least not as many as usual), no shopping disasters (unless you call not being able to find a Bill’s hat anywhere) and so nothing to write about. This makes posting daily difficult. I am making an effort, but at the same time I don’t want to write the same boring thing over and over. I need work in creating an interesting post out of nothing. But today was just, go to work, then go shopping for a calendar and pens. The State doesn’t buy us calendars. Their reason (that they gave us) is that we have a calendar in our e-mail program and we can print off a daily page if we need. The problem I have is you can’t take your computer in the field with you, and I doubt this idiots can figure out how to print a page from their calendar when I have problems doing it. One of the guys was asking about not getting a calendar, “Really? Are you effing kidding me? We haven’t gotten calendars in a few year, you’re just now noticing?” So that is why I was buying calendars this evening, not for him, for me. While I was buying a calendar for my office, I decided it might be a good idea to buy one for my apartment. So before I go hang it up, I am going to check my Google calendar to see if I need to write anything on it. Today is my off day so I am trying to catch up. I have caught up with my Yankee blog, but that is easy since I am writing a post for every game and I just have to look up the games on MLB.com. This blog is my life, which right now is rather boring. Earlier I was walking around my apartment and looked out the window, it looked like something was stuck to my fire escape. 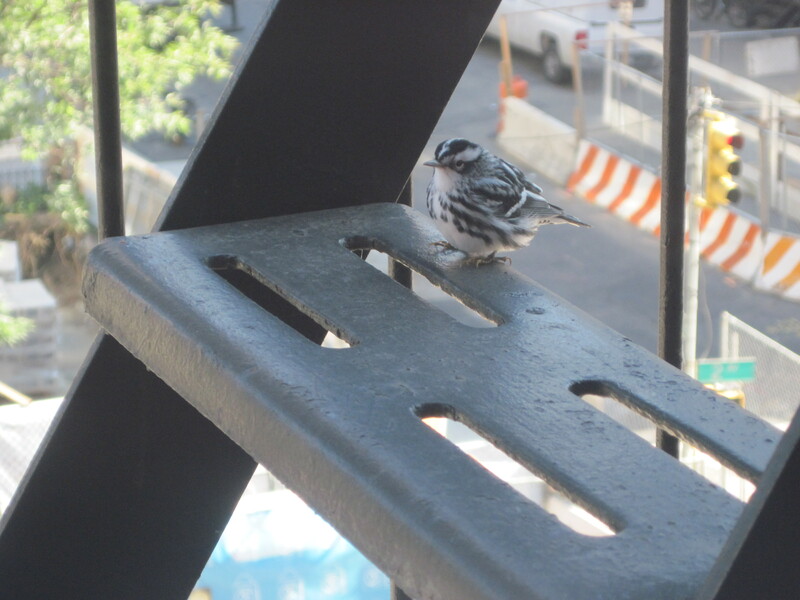 When I walked closer to my window I saw it was a little bird, a chickadee I think. I ran to get my camera, hoping he would still be there when I got back and I could get a picture. I got several pictures. He didn’t even fly away when I put my face up to the window and started talking to him, just hopped to the other side of the fire escape. Now I have to go, I do have things to do, I plan on being back tomorrow to write more. My boss and I were talking about moving the other day. He has recently purchased a house and moved. He was telling me about when he was moving in and had to stop to get something to eat, so he heated something up in the microwave and ate it. As he was sitting and eating it, he had the thought, this is home now.